Another round of big voices dukeing it out in the ring. Lets get to this, shall we? Xtina tells her team that Geoff McBride and Sera Hill will be the first match up tonight. The will be singing Chain of Fools by Aretha Franklin. (Have I ever mentioned I named my car Aretha? She is a diva and she ain’t afraid to flaunt it). Geoff gets to work with Lionel, and he is a bit starstruck. Sera gets some pointers from Jewel. In battling it out in the ring I was impressed with the precision of Sera’s voice in her runs. She is a technical, polished vocalist, and while Geoff has the power, he lacks the precision. I would choose Sera in this matchup. And clearly Xtina agrees with me, and she also chooses Sera. On TEAM BLAKE, Charlotte Sometimes goes against Lex Land singing Pumped Up Kicks by Foster The People. Charlotte gets to train with Kelly C, Lex gets to train with Miranda. Between these two ladies, I think Lex is the most versatile, although Charlotte is probably better on tv. Blake picks Charlotte for his team, and Lex seems so sad. Aww. On TEAM CEELO, Sarah Golden and Juliet Simms will battle it out with Rod Stewart’s Stay With Me. Sarah gets to train with Babyface, and Juliet trans with NeYo. It is pretty clear Juliet has the more interesting tone. I don’t think there is much more Sarah could do – she did the best she could with the song she was given. The harmonies and arrangement were great though. CeeLo chooses Juliet, of course. In the land of TEAM ADAM, it is Whitney Myer vs. Kim. They are singing No More Drama by Mary J. Blige. Whitney gets to train with Alanis. She over thinks many things and seems to have confidence issues. Kim trains with Robin Thicke which she surprisingly seems pretty excited about. Whitney seems really nervous at the beginning and her voice waivers a bit. The blending of both of their voices on this duet is the worst of all the battle rounds that we’ve seen so far. For once, I was not a fan. Adam chooses the obvious choice and goes with Kim. Back with Xtina, she pairs up Lyndsay Pavao and Lee Koch. She assigns them Heart Shaped Box by Nirvana. 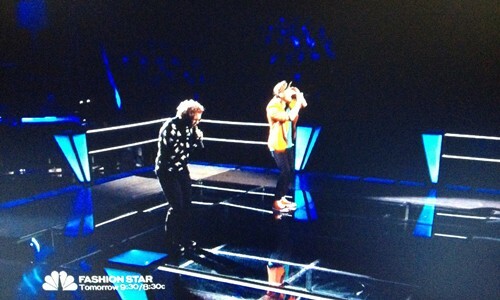 Lee is training with Jewel, and he appears to be struggling with the song and the performance. Lyndsay trains with Lionel and she learns she needs to work on stage presence. This is a very dark haunting song for this pair of indie singers. I don’t love either of these two after this performance. Not great! But Xtina goes with Lyndsay, who I do feel was better suited for the song. Last up, CeeLo pairs up Jamar Rodgers and Jamie Lono to sing I Want To Know What Love Is by Foreigner. Jamie, who had a great audition with Folsom Prison Blues, is very nervous and has voice crack issues. He trains with Babyface, who tries to give him some pointers. Jamar gets to work with NeYo. Jamar is the clear winner of the duo, and I think he would have been even more successful with a different partner. It is too bad Jamie was sort of set up for failure with this matchup. CeeLo goes with the obvious choice–Jamar. This weeks battles weren’t as impressive as last week. It wasn’t for fault of the singers, but more so the song choice or matchup being severely uneven. We are halfway through the battles, so we’ll see what next week brings. I can’t wait to get to live voting! Results Show, “JLo Almost Has a Nip Slip” Edition. I can’t wait to see the new season of the voice I really enjoyed the first one. I hear they’re making a UK version no way will it be as good ad the US. I love it when they do the showdown.